Summary and Highlights of End This Depression Now! Chapter 1: There are lots of unemployed people and they are suffering. Unemployed people are hurting and are not happy. Chapter 2: Because the structural theory is wrong, insufficient demand is the only explanation for what has happened. Chapters 4 and 5: Because the mortgage mess was not exclusive to low-income borrowers, the mortgage crisis was primarily inequality gone wild. Government was not an independent force, except perhaps in lending a bit too much to low-income borrowers. Chapter 7: The stimulus should have been bigger. Chapter 8: The deficit is over-rated. Chapter 9: He was right about inflation. Chapter 11: “Austerity” has depressed economies, not expanded them. Chapter 12: Spend like crazy, and the economy will fully and quickly rebound. Chapter 10 could stand by itself as a very nice mini book. One quibble: it could benefit by discussing what happens to unemployment benefits, from a household point of view, during a currency devaluation. Chapters 4 and 5 arrive at many incorrect conclusions, but I totally agree that social scientists interested in just about any social change in the last thirty years have to look at growing inequality as one of the potentially key driving forces. That's the point of my 2008 QJE paper (with Yona Rubinstein) about how growing inequality may be the single biggest factor transforming the women's labor market (transforming for the better, from the "progressive" point of view). That's also the point of Chapter 10 of The Redistribution Recession. Growing inequality has produced some "bad" results too, and it's worth looking over Krugman's list. I agree that the government budget deficit gets way too much attention, and thereby distracts from the real issue (incentives faced by individuals and businesses). But after that basic insight, Chapters 7 and 8 are confused, and misleading. They engage in the usual trick of conceptual flip-flopping between government purchases and government transfers to individuals, without ever noting the distinction and how different the economic effects of these are. Those chapters claim that Democrats did not expand government spending, the recession did. When scoring the effect of Democrats on government spending, Krugman says, you have to exclude the "income security" components. But Chapter 3 of The Redistribution Recession shows how safety net program spending grew primarily through legislation changes -- usually Democrats (esp. Obama and Pelosi) putting their signatures on new laws. Income security spending would have grown much less if the laws had been constant and the programs merely reacted to the growing number of unemployed. Krugman might say that the recession necessitated law changes, but then his claim becomes tautological: government expansion that Krugman deems as needed is not government expansion. Krugman takes credit, largely deserved, in Chapter 9 for being basically right about inflation in the short and medium term. Does that qualify him as an expert on the labor market? What about as a predictor of the next Superbowl's winner? I doubt it. The term “austerity” is too imprecise for my taste -- I'd like to see at least something about marginal tax rates and the distinction between purchases and transfers -- but I basically agree (see Q6 here) with Chapter 10's conclusion that austerity has failed to expand the economy. Are Keynes and Sectoral Shifts Mutually Exclusive? The decline of home construction is not the primary reason that our labor market remains depressed: Keynesian policies are. If we accept that the housing sector was overbuilt by 2006, then it might seem inevitable that a recession would follow as the housing sector downsized, workers shifted from construction to other industries and workers moved from overbuilt regions to other places in America. But as Paul Krugman points out in his “End This Depression Now!” the recession of 2008-9 did not have many industries that were growing, let alone growing as a consequence of reallocation away from home construction. Moreover, transitions between industries and regions have happened before, but happened gradually as demographic and other trends slowly but powerfully altered the composition of economic activity. By comparison, this recession came on suddenly. To put it another way: for every worker that construction lost between 2007 and 2010, the rest of the economy lost at least another five workers, rather than gaining workers. I agree with Professor Krugman and other opponents of the “sectoral shifts theory” that something must have happened — in less than a year or two — that profoundly affected practically all industries and practically every region. But just because sectoral shifts are at best a small part of what happened does not mean that huge government subsidies would take the labor market back to what it was before the recession. A Keynesian-style demand collapse is not the only aggregate event that could happen or did happen. In my new book, I explain how, in the matter of a few quarters of 2008 and 2009, new federal and state laws greatly enhanced the help given to the poor and unemployed — from expansion of food-stamp eligibility to enlargement of food-stamp benefits to payment of unemployment bonuses — sharply eroding (and, in some cases, fully eliminating) the incentives for workers to seek and retain jobs, and for employers to create jobs or avoid layoffs. Economists normally think that eroding incentives (as they call it, raising marginal labor income tax rates) depresses the labor market rather than expanding it, and that it would be tough for the labor market to get back to its 2007 form without returning incentives to what they were back then. Yet Professor Krugman asserts that he would end this depression now with an even bigger stimulus — with more help for the poor and unemployed — that would further erode incentives and further penalize success. “DeepenEnd This Depression Now!” is full of interesting and relevant observations, but don’t expect its author to mention, let alone appreciate, a non-Keynesian explanation for any of them. A fundamental flaw in much of the advocacy for government spending to “jump-start the economy” has been a failure to adequately distinguish government transfers to individuals from government spending on goods and services. When the Obama administration designed the American Reinvestment and Recovery Act in early 2009, its chief economic adviser and one of the act’s enthusiastic advocates was Prof. Christina Romer of the University of California, Berkeley. Ever since, Professor Romer has insisted that opposition to the act’s purported stimulus value is largely motivated by ideology, contrary to empirical evidence, and is getting in the way of the even bigger stimulus that is needed. I agree with Professor Romer that plenty of historical episodes featured surges in government purchases of goods and services, especially but not exclusively purchases by the Defense Department. Moreover, I agree with her that historical episodes can be informative about the modern-day effects of government purchases. The fatal flaw in Professor Romer’s evaluation of recovery act’s effects occurs when she assumes that transfers to the poor and unemployed have the same employment and output effects as government spending on goods and services. Economic theory and common sense tell us that paying someone to build a tank or pave a highway – as government purchases often do – has a very different effect than paying them for not working or paying them for earning less rather than more – as the law’s transfers did. Professor Romer calls herself “an empirical economist” and might therefore eschew economic theory and common sense until it is supported by empirical evidence. But she fails to mention that dozens, if not hundreds, of empirical studies have found that safety-net programs discourage people from working and discourage employers from hiring (there are so many studies that there are now studies of studies, summaries of meta-analyses and so on). That literature offers a range of estimates, and sometimes passionate arguments among its authors, but certainly does not support the idea that incentives are negligible, especially when the government obtains the large majority of the proceeds of a person’s work. Understandably the law was put together hastily in early 2009 as people feared that the recession was getting out of control, and some bases were momentarily left uncovered. But almost four years later, an empirical economist should have noticed that the legislation eroded incentives to work and eroded incentives for employers to hire or avoid layoffs, and that these parts of the act by themselves are likely to have reduced employment and certainly did not expand it as much as government purchases would. An empirical economist would also notice that the demographic groups whose work incentives were eroded the most by the law, like unmarried people, were remarkably the same groups whose employment and work hours fell the most. By further expanding safety-net programs, a bigger stimulus would only have created more groups with labor-market outcomes like the unmarried and enlarged the ranks of people for whom government help permitted them to spend more by working less. Professor Romer might point to a study the President’s Council of Economic Advisers released shortly after she left in 2010, contending that extending the duration of unemployment insurance increased national employment. But that study suffers from the same flaw, because its estimates are based on the backward assumption that the historical “multipliers” for government purchases apply to transfer-program spending too. In my new book, I explain how the American Reinvestment and Recovery Act did not erode work incentives by extending unemployment benefits (those extensions, examined in the White House study, were put in place by other legislation), but rather by giving unemployed people bonuses, paying for most of an unemployed person’s health insurance and expanding the food stamp program, to name just a few provisions. Throughout the time Professor Romer has been trying to convince us that the law expanded our economy, she has failed to mention that it eroded work incentives, and she has not explained how its transfers could possibly have the expansionary effects of historical military buildups and the like. One might expect that the tax credits part of the law would have enhanced incentives and thereby help offset the incentives that were eroded by its transfers. However, many of the tax credits were withheld from people from high incomes. Regardless of whether redistribution is achieved by collecting more taxes from families with high incomes, providing more subsidies to families with low incomes, or both, an essential consequence is the same: a reduction in the reward to activities and efforts that raise incomes. Studies suggest that the American Reinvestment and Recovery Act helped keep living standards out of poverty, a great benefit that may be worth depressing the labor market. But empirical evidence, economic theory and common sense all contradict Professor Romer’s assumption that transfers to the poor and the unemployed raise employment about as much as the same amount of government spending on goods and services. Consider a married dual-earner couple with two young children. Both adults earn $600 per week when at work full-time, which is near the left-middle of the full-time earnings distribution. When both are employed all year, as they normally are, the family’s income exceeds $60,000, is about triple the poverty line, and exceeds the income of a majority of families in America. Nevertheless, this couple illustrates how just a small bit of program participation can completely erase the financial reward from working. When at work, they spend $100 per week for the care of the children and each spend $50 commuting (about $5 for a one way trip to work). If one of the adults were not at work, these costs fall by a total of $150 per week as the non-employed spouse takes care of the children and does not commute to work. In the middle of 2009 (26 weeks into the year, with 26 weeks to go), one of the spouses is laid off, and is entitled to $289 per week for the first ninety-nine weeks that she is unemployed. The best job she can find in the short term pays $500 per week: a 17% pay cut. What would she and her family gain financially by starting a job immediately, rather than waiting until 2010 to seriously consider going back to work? First of all, working the second half of 2009 would provide $500 per week in pre-tax income, and $461.75 weekly after payroll taxes. As compared to not working receiving $289 UI per week, that’s a difference of $172.75 after payroll taxes. But working will require some expenditures on childcare and commuting, which I have estimated as a combined $150 per week. Without accounting for any other federal or state income taxes, we have that working a full-time work week adds a mere $12.75 to the family’s disposable income. In case you are looking at this on hourly basis, that’s about 32 cents per hour, and we have not yet begun to count personal income taxes! Working the second half of 2009 would make taxable income of $36,850 ($59,800 family earnings minus a standard deduction of $8,350 minus $3,650 for each of the four family members) rather than $28,964 ($46,800 family earnings plus the $5114 worth of UI that is taxable minus the aforementioned deduction and exemptions). Ignoring tax credits for the moment, working involves $1,183 more federal income taxes (i.e., this family is in 15 percent bracket regardless of the work decision) and about $237 more state income taxes for calendar year 2009. That’s $54.62 extra taxes for each week worked. Regardless of when the laid off spouse goes back to work, this family has calendar year earned income of less than $110,000 and therefore qualifies for the full “Making Work Pay” credit and the full amount of the child tax credits (totaling $2,000). The Earned Income Tax Credit is zero regardless of the work decision because family calendar year wages exceed $41,000. So the bottom line financially for this family is that sending the laid off spouse back to work immediately results in less disposable income ($32 per week less if income tax withholding coincides with the actual tax liability) for the remainder of calendar year 2009 than they would have if the spouse remained unemployed for the remainder of the year. Of the pre-tax $500 that would be earned per week, $50 goes to commuting, $100 to childcare, and $38 to payroll taxes, and $55 for extra personal income taxes that would not be owed on unemployment benefits, leaving $257 after work expenses and taxes that could be avoided by not working. Unemployment insurance pays better – $289 per week – for up to ninety-nine weeks. Tens of millions of people participate in Medicaid and SNAP (food stamps) when a bread-winner is unemployed, but to be conservative and keep the illustration simple, above I assume that this family does not participate in dozens of government anti-poverty programs: they only participate in UI and claim any credits that are available to them on Form 1040. Nevertheless, their financial reward to working is negative – they have to spend less in order to be able to afford to work more. This illustrates why government safety net programs have quite a large effect on work incentives, and why even a small program can turn work from a net financial positive to a net financial negative. If the person losing her job in this example had not been married, but still had the two kids and still had the same earnings opportunities, not working would provide even more disposable income because the person would be on the phase-out portion of the EITC schedule as a result of being unmarried. Even if childcare were free, work would still have no financial reward. The Redistribution Recession has many more examples like these, and estimates how common they are in the non-elderly U.S. adult population. Among non-elderly household heads and spouses employed full-time during the reference week and sampled by one of the twelve 2007 CPS monthly surveys, $600 was at the 35th percentile of their weekly earnings. Among heads and spouses less than age 40 (and thereby more typical of persons with young children), $600 was at the 40th percentile. For simplicity, my tax calculation below does not explicitly consider the child care expense tax credit; the $100 weekly child care expense should be interpreted as net of the credit (if any). The typical replacement rate is 44%, plus the $25 per week Federal Additional Compensation bonus provided by the ARRA. 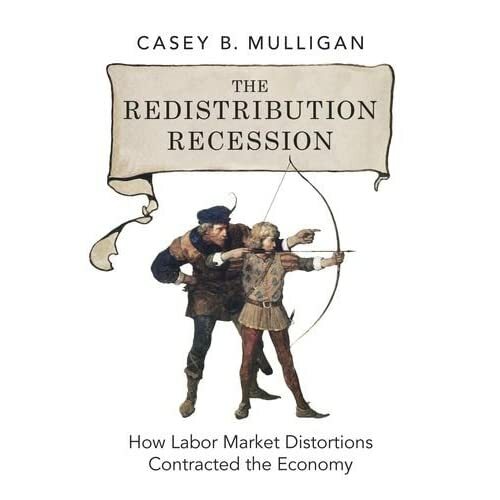 The Redistribution Recession is now available as an ebook! Amazon.com just made it available, in color, in its kindle store. The free sample will take you through page 18. Don't forget that The Redistribution Recession website also offers electronic resources for readers. The labor market effects of employer confidence are probably real but have been exaggerated. American employers have hired more than 230 million times since the recession began, but need to hire even more for employment per person to return to what it was five years ago. One explanation for this state of affairs, according to the Mitt Romney campaign, has been a supposed lack of confidence among employers who are worried about taxes and new regulations, especially those associated with the Affordable Care Act (often referred to as Obamacare) as it is fully put in effect. It is easy to find a businessman worried about government intervention, but the prevalence of such worries does not by itself tell us whether a lack of employer confidence depresses employment 10 percent, 1 percent or 0.1 percent. Presumably if we have two employers who can hire workers at $20 an hour for the same task, the more confident of the two will hire more people than the less confident one, all else being the same. To put it another way, the less confident employer will require a greater immediate profit from his next $20-an-hour hire than the more confident employer, to compensate the less confident employer for the extra tax and regulatory costs associated with the hire that he anticipates in the future. To the degree that an erosion of employer confidence has depressed the entire labor market, we should see the immediate profit from employees grow over time, as employers perceive more tax and regulatory costs on top of the cash and fringes they already owe their employees. 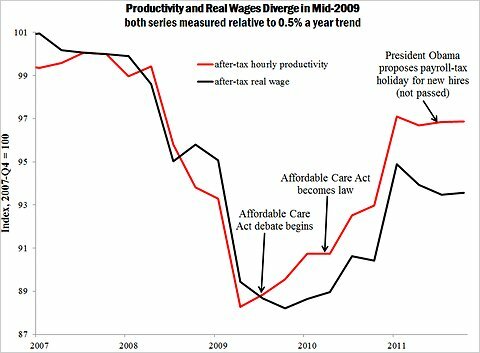 About the time the Affordable Care Act was debated, after-tax productivity began to recover, and more quickly than after-tax real wages did. By the end of 2011, wages had still not recovered as much as productivity had. Something prevented wages from keeping up with productivity, and perhaps eroding employer confidence is part of the story. But even if employer confidence were the whole story, it still explains less of the labor-market depression than do taxes on employees and subsidies for people who do not work. In early 2010, for example, after-tax real wages had been depressed more than 11 percent, of which only two percentage points were because of a failure of wages to keep up with productivity. As I explained in a previous blog post, subsidies for people not working are the primary reason that wages fell so much after taxes and subsidies. It would be incorrect to attribute all of the deviation between productivity and wages to employer confidence. A change in the composition of demand in the direction of less labor-intensive industries would have a similar effect, even if employer confidence had remained constant. New Keynesian economists also blame some of the deviation on a failure of employers to adjust their prices fully to their production costs. Moreover, it is possible that employer fears of future regulatory and tax costs would not depress employment even while they depressed wages to the degree that employees eagerly anticipate benefits they would receive from those regulations and taxes. While traces of eroded employer confidence are seen in labor market outcomes, it also appears that eroded employer confidence explains less than one-quarter of the overall depression of the labor market. Both are selling the book for $30 including shipping. Sales taxes have been hiked by several states and localities as their revenues declined with the economy. I estimate that the weighted-average state sales tax rate increased 0.5 percentage points from 2007 to 2010. When you consider the narrowness of the sales tax base relative to the payroll tax, the state sales tax hikes are equivalent to a 0.2 percentage point payroll tax hike in terms of their national labor market impacts. If alive today, would Keynes join most of the economics profession and assess the current economic situation without any reference to labor supply incentives? I don't know, but it is worth noting that Keynes' writings about periods of high unemployment consider supply incentives more than his 21st century followers do. In particular, his 1919 Economic Consequences of the Peace repeatedly looks at supply channels. Europe at the time had a population of 450 million people. I believe that unemployment was a problem at the time, but more important I think Keynes perceived it to be a problem as he describes "that 15,000,000 families were receiving unemployment allowances." If we assume that a 450 million population would support a labor force of about 150 million (ie., excluding women, small children, and noting that the post-war population was likely disproportionately female), that makes an unemployment rate of at least 10% and more to the degree that (as is the case today) some of the unemployed were members of families not receiving assistance. ...the regulation of prices, contains in itself, however, the seeds of final economic decay, and soon dries up the sources of ultimate supply. If a man is compelled to exchange the fruits of his labors for paper which, as experience soon teaches him, he cannot use to purchase what he requires at a price comparable to that which he has received for his own products, he will keep his produce for himself, dispose of it to his friends and neighbors as a favor, or relax his efforts in producing it. If you are open to the idea -- supported by extensive research -- that labor supply incentives might still matter during depressions, take a look at the startling findings in my new book The Redistribution Recession. Dean Baker claims today that the labor market experience of young people refutes my finding that redistribution is the single largest factor depressing the labor market since 2007. In doing so, he gets some of the facts wrong and neglects several economically important connections between redistribution and the labor market. I explain in The Redistribution Recession that, among household heads and spouses, safety net expansions did more to erode work incentives among young people than they did among middle-aged and elderly people because young people have wages that are relatively low compared to (a) the dollar amount added to safety net benefits, (b) the dollar amount of their unsecured student loan and other debt, and (c) the cumulative dollar amount of the three minimum wage hikes (Dr. Baker thinks that minimum wages don't affect employment among young people, but he's wrong about that too). A $400 per month food stamp benefit is not considered small change to a person who was earning the pre-recession minimum wage of $5.15 -- they'd have to work over 80 hours to make that much after taxes. Redistribution affects labor demand too. Measured in terms of marginal tax rates, these effects are also larger for young people than for middle-aged people because young people are less productive. For example, if employers perceive a new unemployment-insurance-fund expense associated with each employee that was 3% of what middle-aged employees produce, and middle-aged employees are twice as productive, then the perceived expense would be 6% of what a young employee produces. Even if marginal tax rates had increased the same amount for young people as for every one else, labor economists believe that young people are more sensitive to incentives because they are not settled into an occupation (e.g., they could stay in, or go back to, school), do not have older (more expensive) children, etc. In other words, a uniform increase in marginal tax rates need not create the same behavioral change for all groups. Dean Baker is confident that young people compete with middle-aged people in the labor market, so that a depressed labor market for middle-aged people would mean a boom for young people. More work is needed on this issue (I treat it briefly in Chapter 5 of the Redistribution Recession), but I suspect the opposite: that the young and middle-aged are complements in production: young workers are not very helpful without more experienced people to supervise and train them, and otherwise be part of the larger production teams that are prevalent in our economy. A related phenomenon: young people are especially likely to work in restaurants or as babysitters, but when the middle-aged labor market is depressed middle-aged people will sometimes do their own cooking and childcare rather than hiring young people to do it. My book notes, even embraces, the fact that part of the depression of our labor market is not because of safety net expansions or other marginal tax rate increases. But that is small part (my best estimate: 25% of the total depression, even while it is 95+% of the academic and public policy discussion), and is not dominant in the aggregate data. As with any small effect, you might see it better if you zoom in on the right group. Most of my marginal tax rate work so far has pertained to household heads and spouses. I would be happy if other economists, even Dr. Baker, would compute marginal tax rate series for teenagers and other potential workers who are not heads of their household, so we could see what lessons might emerge. If you buy directly from the publisher. It may take a week longer for on-line sellers to get their stock and get organized. Aggregate wage-rate data show no sign of the huge and prolonged demand shock said to have hit the economy in 2008. Instead, they bear the fingerprints of an expanded social-safety net. A conventional narrative of the American labor market since 2007 is that the demand for labor collapsed, so that despite a uniformly willing and eager work force, millions of people had to go without jobs. This narrative is an aggregate theory and not primarily about sectoral shifts that would depress demand for some types of labor and increase it for others. If this narrative is accurate, it should be visible in aggregate wage-rate data. At a minimum, the aggregate demand collapse should have frozen wage rates in dollar terms, so that inflation-adjusted wages would erode with inflation as consumer prices crept up. With the price index for consumer items 8 percent higher at the end of 2011 than it was when the recession began, inflation-adjusted hourly wages should have fallen at least 8 percent over that time frame, if not more. I expected real wage rates (and hourly labor productivity) to rise in the short term, and to do so a couple of percentage points above the previous upward trend made possible by continuing progress of the productivity of labor and capital. Marginal tax rates increase real wage rates a few percentage points in the short term because, with more help during unemployment, employees at struggling businesses have less reason to make some of the concessions in wages and working conditions that can help the employer to retain employees affordably. As I explain in “The Redistribution Recession,” wage rates would quickly fall back toward the trend line when some of the temporary safety-net measures began to expire, which was two or three years after the recession began. Those safety-net expansions that were permanent would eventually reduce average real wage rates, as people out of work reduced their human capital investment. This reduction might reflect people who, because they no longer practice a trade, lose contacts in the workplace or no longer maintain a wardrobe or tools they need for work. (For more on this effect, see especially the literature on women’s wage trends.) Unfortunately, these wage reductions do not encourage employers to hire because they derive from reductions in productivity. The black series in Chart 1 below shows aggregate real wage rates measured as inflation-adjusted employee compensation (including fringe benefits like health insurance) per hour worked. I have removed an upward trend, because for short-run analysis it is interesting to look at deviations from trends. Under normal conditions real wages can increase with productivity even while the amount of labor is neither rising nor falling. The trend adjustment is 0.5 percent a year, based on the average rate of growth of total factor productivity during the four years before the recession. Without the trend adjustment, the black series would increase two percentage points more through 2011 than shown. The chart also shows in red the marginal tax rate on labor income measured in my book for a typical household head or spouse based on the ever-changing eligibility and benefit rules for safety-net programs. Sure enough, real hourly compensation increased during the recession and did so about a quarter after marginal tax rates began their increase. Marginal tax rates were high and fairly flat during 2009 and early 2010 as the “stimulus” law was in full force. During this time, real wages failed to fall back anywhere close to their prerecession values. Only when some of the stimulus provisions began to expire, reflected in a marginal tax rate that falls to 44 or 45 percent from 48 percent, did real wage rates decline quickly and significantly. Even after the decline in late 2010 and early 2011, it looks as though real wage rates are about where the previous trend line was, rather than being the several percentage points below what one might expect after a huge, prolonged demand shock. A few economists have used Census Bureau wage data, which ignore the fringe benefits from employment, to show that wages fell during 2010 and 2011. It is incorrect to ignore fringe benefits (I discuss this and other wage measurement issues in Chapter 2 of “The Redistribution Recession”), but the choice of series is just a quibble, because none of the aggregate wage measures display a cumulative decline that would be commensurate with the huge, prolonged demand collapse said to have occurred. A magnifying glass is not required to see a decline in after-tax real wage rates. The after-tax real wage rate (calculated as the product of real hourly compensation and one minus the marginal tax rate shown in black in Chart 2), reflects the net financial reward per hour of working, taking into account taxes and safety-net subsidies. The after-tax real wage series has been adjusted for a trend of 0.5 percent a year. Marginal tax-rate changes, such as those created by an expanding social safety net, cause deviations between the real hourly compensation shown in Chart 1 and the after-tax series shown in Chart 2. 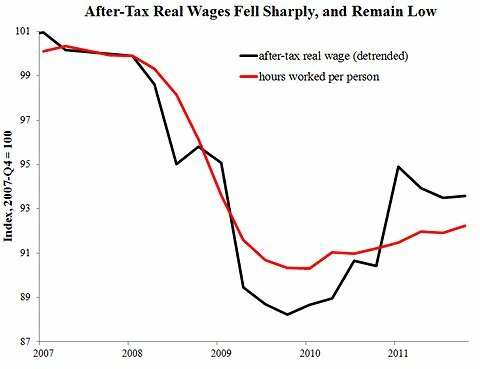 In theory, the downward marginal tax rate effect on after-tax real wages exceeds the upward effect on real hourly compensation. 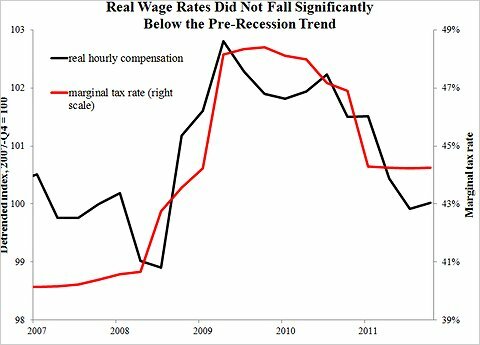 In fact, after-tax real wages fell a startling 12 percent below the trend line during the first two years of the recession (note that each tick in Chart 2 is twice as large as each tick in Chart 1). They rebounded somewhat as marginal tax rates came off their stimulus highs but still remain six or seven percentage points below the trend line. 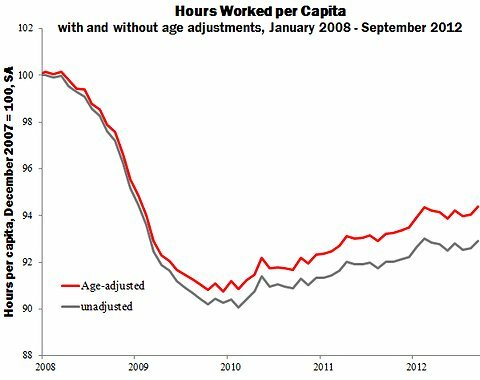 The quantity of labor — hours worked per capita including zeros for people not working – is shown as a red series in Chart 2. Remarkably, labor and after-tax real wage rates collapse together, hit bottom together and exhibit a partial recovery together. Helping the poor and unemployed is intrinsically valuable, but is not free. It has made labor more expensive and depresses employment.